All free accounts will be limited to 1000 photos /videos (combination of both, not each). If you are have over 1000 photos / videos on your account, you will no longer be able to upload any more files to your Flickr account. 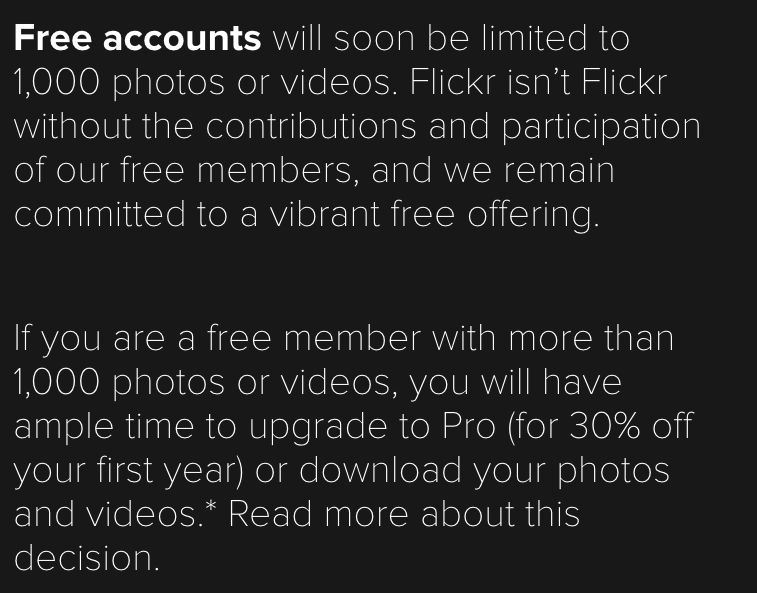 The second and IMPORTANT PART for Flickr free accounts comes on February 5, 2019. Starting on Feb. 5th, free accounts that contain over 1000 photos or videos WILL HAVE CONTENT ACTIVELY DELETED. Flickr WILL DELETE starting from the oldest to newest date of upload. Flickr will delete whatever it takes to bring the account to 1000 files. You upgrade your Flickr to Flickr Pro for $49.99 per year. With a Pro account, you will get unlimited storage, ad-free browsing, video uploads allowed go from 3 min to 10 min (video increase coming early 2019). In addition, you will have available discounts with Flickr partners, like Adobe and SmugMug. Google Photos which offers unlimited space and uploads. There is 1 small caveat: Photos can be stored at a maximum resolution of 16MP and video at 1080p. Amazon Prime Photos, for those who are Amazon Prime members. The service lets you store and share unlimited photos on your desktop, smart phone or tablet. With all the changes at Yahoo, one of the changes was the selling of Flickr to SmugMug. Up to now, Flickr has operated with no changes, but as of January 2019, the announced changes are part of SmugMug taking full control of Flickr. Also happening in January 2019, there will be no need for a Yahoo account to use Flickr.